1 year parts and labour warranty. Next day spares service available. The accumulation of thatch on any grass surface is a major cause of poor grass condition. Dead and dying matter starves the plant of nutrients, creates a spongy, slow playing surface and allows disease to develop. Using the GROOMER/DETHATCHER throughout the growing season is the most effective means of reducing thatch build-up and discouraging lateral growth, allowing a healthy and fast green to thrive. It is fully self propelled and collects debris as it removes it from the turf, leaving a clean and undisturbed surface on which play can continue without the need to mow. Results can be seen and felt immediately. The GROOMER/DETHATCHER shares the same engine, single-drive system, chassis, controls and single handwheel quick-change cutting height adjustment as the Greensmower “SI” model. The chassis has been refined to give optimum balance, making handling feel effortless. Controls are simple and non-tiring, making operation foolproof. A transport cradle is available for convenience and protection from hard surfaces during transportation, and a Wiehle (grooved) front roller can be fitted (see illustration in Greensmower section). To extend its versatility, the Groomer can also be converted to a 6-blade or 9-blade mower to Greensmower “SI” specification, or a brushing machine using optional conversion kits. 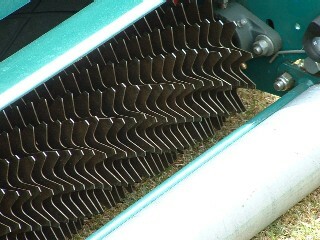 The closely spaced 13-tipped spring steel blades rotate at high speed, cutting and discouraging lateral growth whilst collecting thatch and debris. 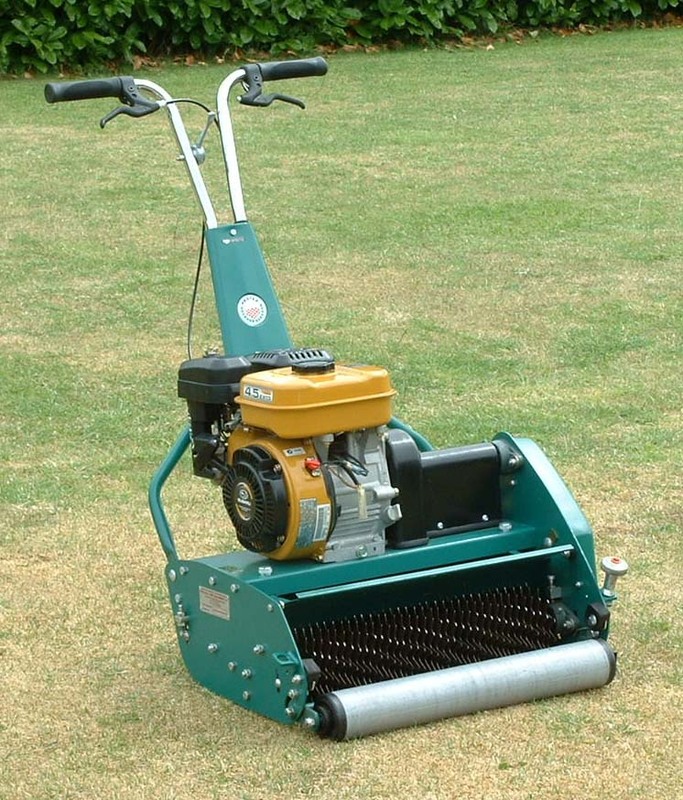 It can also be used for remedial work to remove dead moss, weeds and surface debris making it ideal for use on ornamental lawns, and for collecting scarification debris during Autumn renovation. Groomer blades are hard wearing and can be reversed for extended life. When replacement blades are finally required, they can be supplied individually or as a complete reel at sensible prices. User feedback including numerous customer testimonials has shown that the GROOMER/DETHATCHER produces results which are nothing short of outstanding. No other machine on the UK market offers similar performance at anywhere near the price of the Protea. The GROOMER/DETHATCHER is the ideal partner to any Protea mower, offering an unbeatable combination of performance and quality at a fraction of the cost of any competing cassette-based system. Transmission Centrifugal clutch to cutting reel and plate clutch to landroll drive via 3 roller chains. Front roller One-piece steel front roller with precision adjustment for cutting height. Height-adjustable two-part smooth steel rear roller. Have a question about this verticutter/groomer?